Kailash Colony market’s got some awesome (and underrated) places, where you can head to fill your stomach to the brim. From chaat to kebabs and pizzas to cheap drinks, you’ll find it all here. This place is winning for giving South Indian cuisine an extra dose of cool with their amazing service and the sheer wholesomeness of their menu. Prepare to be welcomed with a teeka and to be lead to a floor full of traditional wall art, some complimentary rasam and papadam, and food with flavour that’s so on-point. We loved the filter coffee, the MLA dosai and the South Indian thaal. For those who love the outdoors, there’s a terrace section too. This Insta-worthy European bakery serves a huge range of breads, desserts, cakes, cookies and decadent shakes. But if you’re in the mood for a quick bite, they’ve also got croissants, sandwiches, rolls and other entrées on the menu. Don’t miss out on their chocolate shake, chicken calzone and mud cake. This iconic spot has not wavered in its consistency for serving quality food. In addition to serving confectionery (cakes, tarts and mousses), there’s also delicious (and filling) on-the-go snacks like seekh kebab rolls, mini-pizzas, hot dogs, shakes and more. Mughlai-lovers, we hear this small outlet serves surprisingly good biryani-gravy combos and platters. The curry menu isn’t the most elaborate, but since they claim it’s their specialty, they’ll deliver well on the quality. If you’re in the mood for a warqi or a roomali roll, you can even make your own by choosing a filling and an optional gravy. This colourful space is a chill spot to hang out with your friends. You can even challenge each other to a round on the pool tables, or watch sports on their screen while your food is being prepared. We hear the pizzas, peri peri fries and dimsums here are worth a try. If you haven’t already tried the cheesy Italian food here, it’s about time you make a plan. 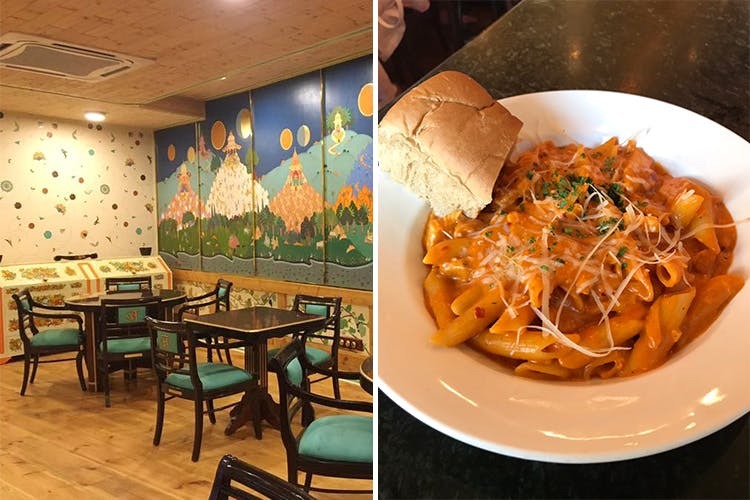 One of Delhi’s most iconic food chains, the retro Hollywood posters, heavenly shakes and desserts, and the dishes which are cooked to perfection keep us coming back for more. If you want to know what to order, here’s a list of their best dishes. You’ll find this place on the third floor, right next to Domino’s. It’s a spacious lounge, which we’d recommend for when you’re in the mood to chill with your friends and have a round of drinks. They also have live music, and host regular DJ nights. Keep an eye on their events here. We’d suggest heading here between 12pm to 5pm, when they run an amazing 99 menu which includes beer, rum, veg and non-veg snacks, cocktails, hookah and more – all at INR 99! Don’t miss their chicken malai tikka or the dahi ke kebabs. Craving golgappas and pav bhaji? We’d recommend this for when you’re jonesing for some flavoursome chaat and desi street food. It won’t be heavy on your wallet either. The seating area is not the best, but it does the job. The decor is not the only impressive thing here. The menu changes every day, and it’s a good spot to grab your morning coffee, a crispy pizza, fresh salads and various Mediterranean treats. It’s also a mini-market which sells fresh produce and home-made products like mayonnaise, baba ganoush, pesto, hummus and more.